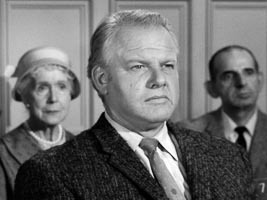 After watching the show for awhile you may begin to notice the same faces appearing repeatedly in minor roles such as spectators in the courtroom. The question that naturally comes to mind is, of course, who it that? Hence, the title of this page. A curious aspect for some of these people is the frequency with which they appear clearly, if not in focus, in those lingering closeup shots of "interesting parties" seated in the gallery during courtroom action. Here's a sample. From #137, TCOT Unwelcome Bride. This page has been created to remember these unknown actors that we see all the time. If you recognize any of them, and can supply some kind of documentary evidence to support your identification, please email me. There's an email icon in the sidebar. If you have a favorite frequent face you would like added to the gallery, please save up sightings until you have seen them in at least five episodes and then email me with enough details that I can find them in each episode. I'll confirm the sighting with you and add the person to the gallery. Thanks! If you should spot one of "our" people, please record it in the episode's Trivia section with the tag Sightings: (bold) at the beginning (example here). Thanks! 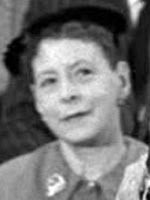 This lady is seen in a high percentage of episodes through much of the series. Reported in the opening credits (Style P) starting with Season 2 sitting in the back row of the courtroom gallery behind Burger and Tragg by Rich Miller, 11/30/02. Rich also says she was on a jury once. First episode report as seen in #27, TCOT Desperate Daughter, by Joe Gill, 2/17/04. Joe also noted that she is seen walking in the courtroom hallway as the perp is pinched by the bailiff in #106, TCOT Red Riding Boots. Earliest episode sighting is #25, TCOT Empty Tin, reported by Grace Palazzolo, 8/30/11. 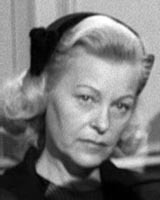 Reported first by Grace Palazzolo, 9/17/10, then by Evelyn Erlichster, 11/3/10, and finally pushed over the top by Kelvin Chambliss, 11/10/10, with several sightings, this lady is seen in the Style P opening credits and in a variety of roles including courtroom spectator. The picture is from the Opening Credits. Seen often, at least in the first four seasons, as court reporter but also as a waiter, elevator operator, gallery spectator and in other minor roles. Reported by Martin Haymond, 6/10/10. Also seen in the opening credits (Style P) starting with Season 2 sitting in the back row of the courtroom gallery behind Della and Paul. Yes, that is Little Old Lady in a Hat sitting behind him on the left in the picture. Another member of the Style P opening credits, this man has also been seen in the courtroom gallery, on a jury and in other roles. Officially reported by Kelvin Chambliss, 10/29/10, he has also been sighted by Grace Palazzolo on occasion. The picture is from the Opening Credits. That is Lt. Tragg to the right. This older gentleman has been seen in the courtroom gallery in many episodes. I don't remember if he was ever reported. Reported by Grace Palazzolo on 9/9/10, this chap with the dark circles around his eyes and been seen in the courtroom gallery in several episodes so far. Unfortunately, he never seems to get any good closeups so the picture is rather poor. Reported by PaulDrake 33 on 7/11/08, this chap has been seen in the courtroom gallery in several episodes. Reported by Grace Palazzolo on 8/17/10, this stylish lady has been seen in the courtroom gallery in several episodes. In #57, TCOT Jaded Joker, she walked out of the courtroom in front of Frankie Laine! Reported by Evelyn Erlichster on 8/23/10, this rather elegant lady has been seen in the courtroom gallery in a number of episodes. Reported by Grace Palazzolo on 9/2/10, this elegant lady has been seen seen in the courtroom gallery the required number of times and perhaps a few more. The picture is from #89, TCOT Crying Cherub. Reported by Grace Palazzolo on 8/26/11, this lady is seen in the Style F (Season 1) and Style P (parts of Season 2, 3 and 4) credits as well as several courtroom roles. Unfortunately, she is never seen very well. The picture is from Season 1 opening credits. Reported by Alan Jones on 9/11/10, this normal-looking guy has been seen in a variety of roles but not, so far, in the courtroom gallery. The picture shows him as the gardener that Frances Celane almost runs over in #5, TCOT Sulky Girl. Reported by Evelyn Erlichster on 9/12/10, this young woman has been seen in a bunch of episodes in the third season. Reported by Ken McElhaney on 9/19/10, this diminutive gentleman has been seen is a flock of episodes in seasons 4 and 5 so far. The picture shows him as the eponymous tailor in #119, TCOT Violent Vest. Reported by Alan Jones 9/30/10, this elegant lady has been seen in a wide range of episodes. Her name was revealed in #73, TCOT Blushing Pearls. Reported by Alan Jones 10/2/10, this rather thin gentleman has been seen in a variety of roles. The picture shows him working for the police digging on the beach in #72, TCOT Garrulous Gambler.